To see one of nature’s grand spectacles, head to the middle of the New Guinea jungle. Costumed in glossy black and white feathers, with what look like long insect antennae on top of their heads, male birds of paradise from the species Carola’s Parotia perform an elaborate dance. They tilt their heads upside down, hop across their cleared performance area and flutter their wings while bouncing sideways for an audience of females. As a grand finale, they fan their feathers outward into a ballerina tutu and waggle their heads side to side. It’s all for love. Or rather, for the chance to pass on their genes to the next generation. At first glance, these birds appear to defy natural selection, the principle that organisms with favorable qualities will pass on those traits to their offspring. One might think flashy feathers and elaborate dances would be energy-wasting vulnerabilities, and birds with those traits wouldn’t survive long enough to pass them on to the next generation. But natural selection isn’t just about surviving — it’s about passing on genes. Even if a bird has a special trait that helps it survive, if it doesn’t mate and pass on that trait to offspring, no future generation will have that trait. So when male birds like Carola’s Parotia have to compete with each other to mate with females, their chances of mating depend on how appealing females find them. Sexual selection, a particular type of natural selection, kicks in. The male birds with traits that make them more likely to catch a female’s eye, such as a well done courtship dance, mate successfully and pass on those traits. 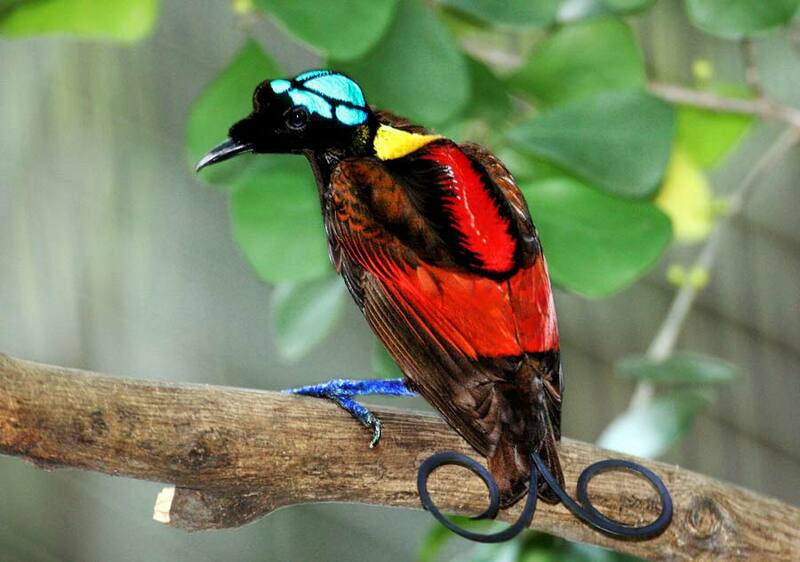 Only the most attractive males mate, so it’s crucial for male birds of paradise to get their dances just right. With so much at stake, they don’t make up their moves on the spot. The dances are precisely choreographed and the males have to execute each move correctly and in a certain order. On a research expedition, ornithologist Ed Scholes of Cornell University and National Geographic photographer Tim Laman filmed males that hadn’t yet gotten their adult feathers practicing their dances. “They’re hardwired from their genes, through their DNA, to start doing courtship displays,” Scholes explains in the video from the Cornell Lab of Ornithology. Their initial displays are only rudimentary, Scholes says, but then the birds refine them. The young males practice both alone and in groups, taking turns dancing and pretending to be the female audience, sometimes with the example of an adult male tutor. These rehearsals can go on for hours, and the birds practice for three to four years before exchanging their drab brown feathers for the striking adult ones they need to have even a hope of winning a mate. Other bird species with fancy courtship rituals include the satin bowerbird, which builds a bower of sticks that it decorates with blue found objects to attract females. The red-capped manakin does a dance that looks sort of like the moonwalk, except sideways on a branch in the forest. Researchers aren’t sure exactly what value females see in these elaborate courtship displays. Potentially, males with traits females prefer also happen to have genes that are good for survival, so sexual selection and natural selection are working hand in hand. While we humans are uncertain what female birds of paradise are looking for in a mate, they certainly seem to have some firm ideas on the question. They direct a rare show we don’t fully understand, but can still appreciate.